Review of: Crack the bank in Smash the Pig slot by IGT at Slotorama! Grab your hammer and go on the hunt for big winnings in the fun new Smash the Pig slot from IGT! This comical new game lets you break the piggy bank to find extra big wins. Featuring two great bonus rounds including the Pick a Pig Bonus and Pig Smashing Bonus, the game has an RTP of 96.17%. These swine hold the key to your riches so smash them to get what's yours! Grab your hammer and go on the hunt for big winnings in the fun new Smash the Pig slot from IGT! This comical new game lets you break the piggy bank to find extra big wins. Featuring two great bonus rounds including the Pick a Pig Bonus and Pig Smashing Bonus, the game has an RTP of 96.17%. These swine hold the key to your riches so smash them to get what’s yours! Pick a Pig Bonus – Land between 3 – 5 scattered pig symbols to trigger the Pick a Pig Bonus round. You’ll be presented with an assortment of swine and you pick a pig to reveal your reward. Prizes can range from random multipliers between 1x-20x the total bet, extra pick chances, and trigger the Pig Smashing Bonus game. Pig Smashing Bonus – This funny bonus round is triggered when you get 3 – 5 bonus symbols scattered anywhere on the reels. Each symbol adds luck to the Luck Meter seen at the top of the casing. Pick a pig to reveal a multiplier between 1x and 20x the total bet. Smashing a pig empties some luck from the luck meter. Keep picking until the luck runs out. If there is luck remaining after 5 pigs are smashed, the remaining pigs run away. New pigs appear and more luck is added to the luck meter. 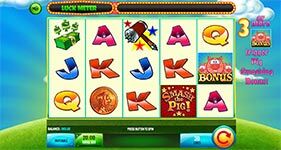 Once there is not enough luck in the luck meter for more pig smashing, the leftover luck will be added as a multiplier of the total bet and awarded to the last smashed pig.